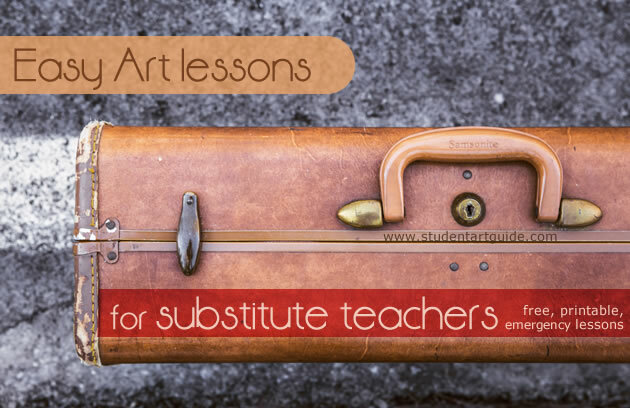 The prospect of preparing sub lessons for middle and high school Art classes (also known as relief lessons) can fill a teacher with dread and be perceived as more unpleasant than returning to school while sick. To solve this problem, we have provided a collection of complete one-off Art lessons that can be printed at the click of a button and administered by any relief or substitute teacher, regardless of their background (or lack of) in Art and Design. These tasks require only basic materials and are absent of elaborate procedures, dangerous equipment and undue mess. Despite their simplicity, however, the exercises encourage students to practise valuable art-making skills and reinforce prior learning in a fun, relaxing and stress-free way. Each lesson in this article will soon link to a substitute lesson plan template that identifies learning objectives, materials required and clear instructions (lesson plans will download as a PDF that can be printed on A4 paper – we are working on these ASAP, please bookmark this page so that you can return to it soon) as well as more detailed illustrations and student examples. 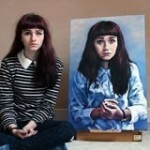 One-day art lessons can also be used by students who wish to undertake extension activities on their own. It should be noted that these exercises are mostly targeted at middle school and junior high school students, as senior Art students typically continue with existing projects when substitute or relief teachers are present. This exercise combines sculptural 3D form with linear observational drawings of angular planes. 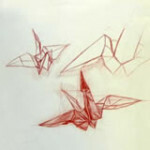 Students are issued with two sheets of white paper and a pencil, as well as instructions for folding the origami crane. 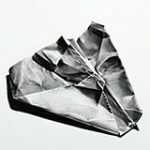 Students fold the paper crane and then spend the rest of the lesson drawing this from a variety of angles, giving attention to line weight and shadows. 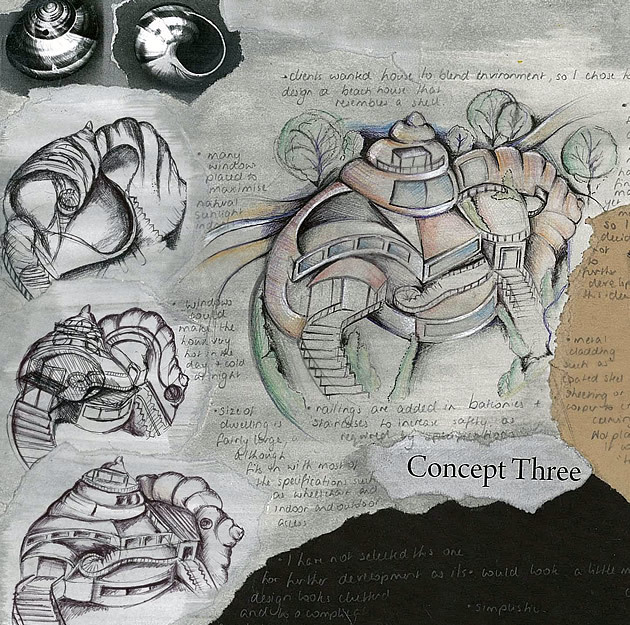 This lesson plan was created by Janet Carter as an introductory task for Year 12 Graphic Design students at ACG Parnell College. Students are provided with white A4 paper and a graphite pencil. Paper is creased, folded, ripped, rolled and torn to create tiny sculptures that each represent a chosen emotion (pain, sorrow, excitement etc). These are then drawn, including shadows, with notes about the chosen emotion. 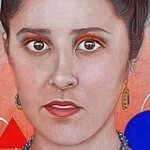 This encourages students to think about how abstract forms, shapes, lines and tone suggest meaning. Students are issued with a square of black paper, a white piece of paper, glue stick, pencil and pair of scissors. 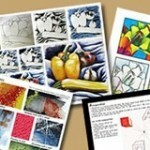 Students then design several simplified images, icons or symbols to represent a chosen theme. Half of each image is cut from the edges of the black square, with the cut out piece flipped over to complete the mirror image of each image, as shown. 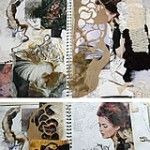 Once completed, all pieces are glued onto a larger sheet of paper. This tessellation Art lesson uses drawing paper, a square or rectangular piece of cardboard, sticky tape, scissors and pencils (coloring pencils can also be used if desired). Students carefully cut a shape from one side of a square of cardboard and tape this to the opposite side (or move it around one side of a square if a rotating pattern is required). This is repeated for the remaining two sides. The cardboard stencil is traced, so that the pattern repeats across the piece of paper. Once complete, students add details, tone and/or color as desired. 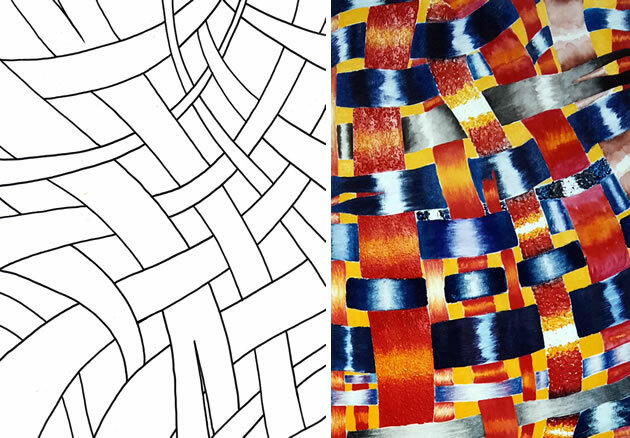 Combining both maths and art, this lesson explores positive and negative shapes, transformation, repetition and symmetry. 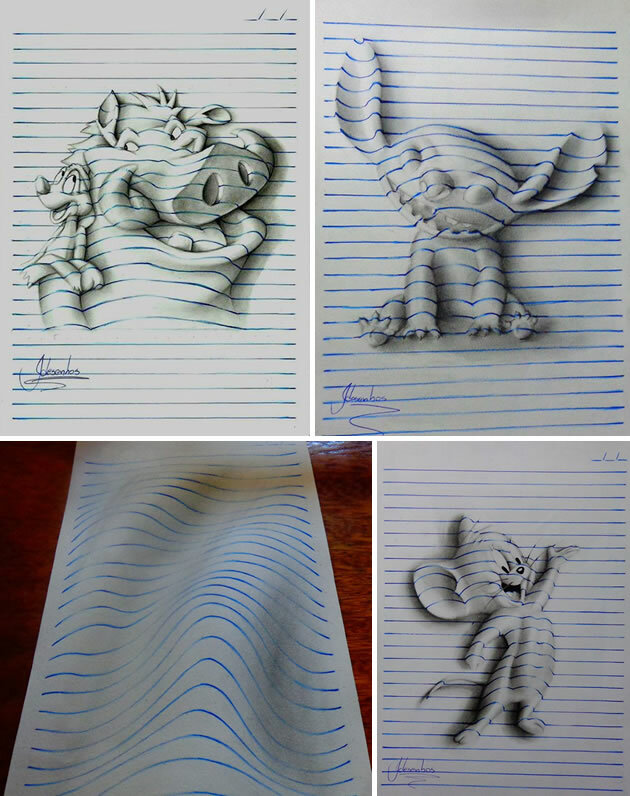 The artwork of Brazilian student João Carvalho recently went viral on the internet and was shared by top design bloggers, helping João to gain over 44,000 Facebook followers. This makes a fun and entertaining substitute Art lesson, requiring only a piece of paper, pencil and blue pen. Students begin by sketching the outline of an object and then ruling blue horizontal lines across the piece of paper, stopping at the edge of the object, simulating the lines on a page. Contour lines are drawn curving up and over the surface of the object, with tone added to help emphasise the form of the object. This sub lesson is derived from a task given to IGCSE Design and Technology students at ACG Parnell College. Students are issued with a box of shells shells, seaweed, seedpods, insects etc (or photographs of these). Each student then generates an architectural design inspired by the shapes, patterns, textures of chosen a chosen organic form. Starting with more abstract explorations, students move towards detailed, resolved designs and may add annotation evaluating functionality, use of materials etc. 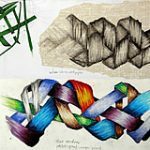 As a variation, students may work upon mid-tone paper and use a black pen and/or colored pencil to emphasise aspects of their design. Note: This lesson can be easily customised, so that students generate concepts for jewellery or sculpture etc, rather than architecture. Many Art classrooms have paper and cardboard that can be sliced into strips prior to class using a guillotine (organised teachers may be able to prepare strips in advance and store in a folder of pre-printed sub lessons). For this exercise, students should select two strips of colored cardboard and then cut, glue, fold and/or layer these in any way desired, to create an interactive business card. It may have cut out portions, pop up tabs or any other feature. 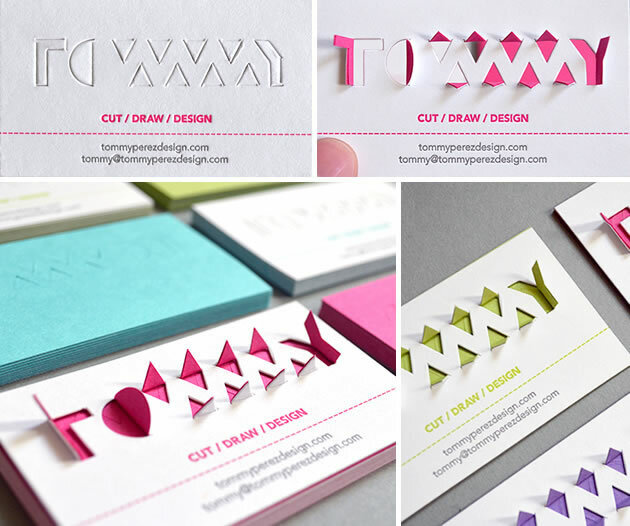 This example by Tommy Perez has die cut tabs that fold out to reveal the color underneath, with the negative spaces spelling the letters of his name. Provided with white paper, scissors and cellotape, students are asked to produce an abstract sculpture. In particular, they should think about how light will pass through the sculpture and cast shadows. 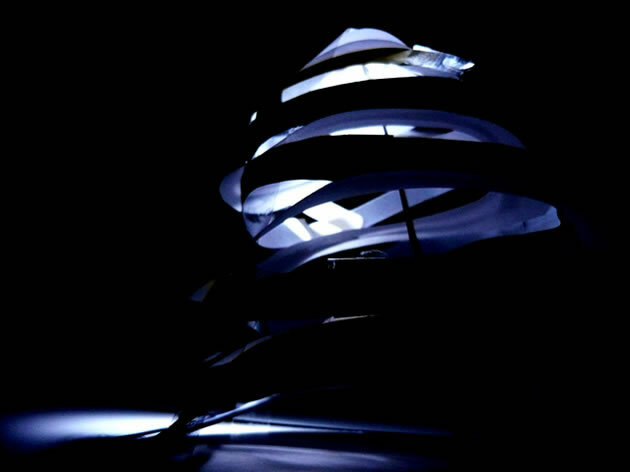 Students photograph their sculpture creatively as a homework exercise, using a spotlight and black sheet as a backdrop, for example. A new craze that is sweeping the internet is ‘coloring for adults’ or ‘coloring for teens’ – purported to eliminate stress and encourage relaxation. With the right direction (and avoidance of simplistic, cartoon-like or other inappropriate imagery) this can become an excellent and enjoyable sub lesson for high school Art students. For example, students might be told to explore a particular color scheme and use this to express a particular emotion; or to use color to draw attention to a focal area within the work. Alternatively, students may practise applying tone, with a still life themed coloring sheet or a drawing of weaving or intertwined ribbons. Note: We are in the process of preparing a lot of awesome coloring worksheets that are suitable for this purpose. Please ensure that you are subscribed to our mailing list below to make sure that you will be alerted when this resource is live! Schools often end up with discarded or damaged textbooks that can be put to good use in the Art classroom. 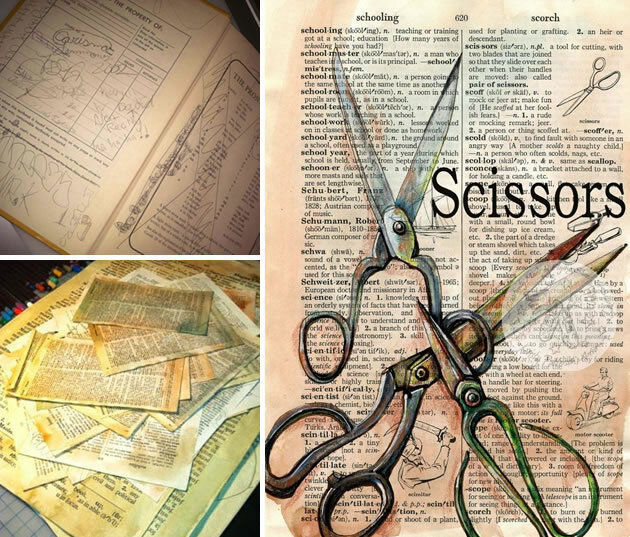 Pages from these books provide excellent fodder for a number of mixed media Art projects, as well as create the basis for this fun one-off art lesson. If you are able to organise your sub lesson file in advance, these pages can be trimmed and prepared with a watercolour, ink or acrylic wash, to exaggerate the illusion of age and strengthen the page before it is given to students. Once the lesson has begun, students glue the dictionary page to a sheet of white paper and then choose a word from the page to illustrate, using black pen and colored pencil. If desired, the pages can be sealed with gel medium or matt varnish once the Art teacher has returned, to help preserve the page. Hand out a photocopied sheet containing black and white images of several disconnected objects. 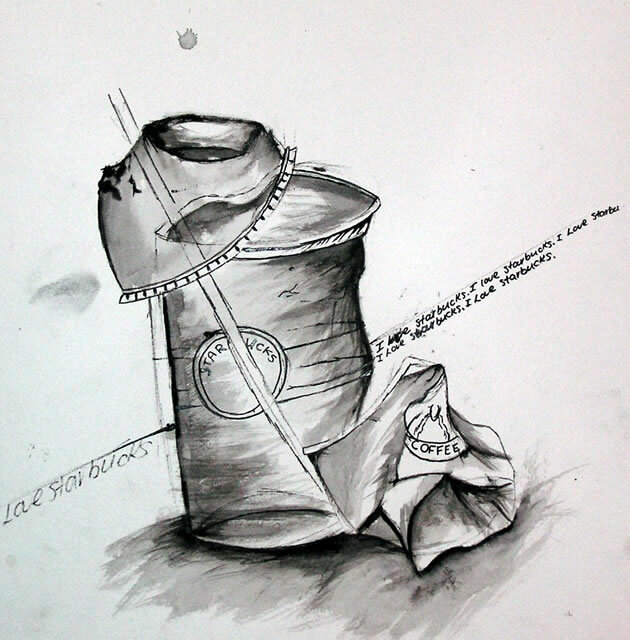 Students select two of these objects and produce a series of four small graphite drawings, showing the metamorphosis of the first object to the second. 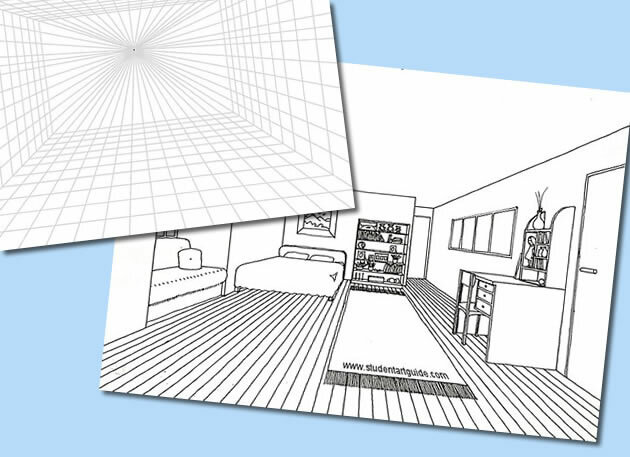 Design a room in perspective using a perspective grid, as in the examples shown in our One Point Perspective Drawing tutorial. This exercise is suitable for students who already have a good understanding of perspective and understand the basics of drawing forms using this drawing method. Students are issued with a black and white photocopy of an appropriate image and are instructed to cut out portions and glue the remainder of the image to a sheet of drawing paper. The image may be disassembled and rearranged during this process. 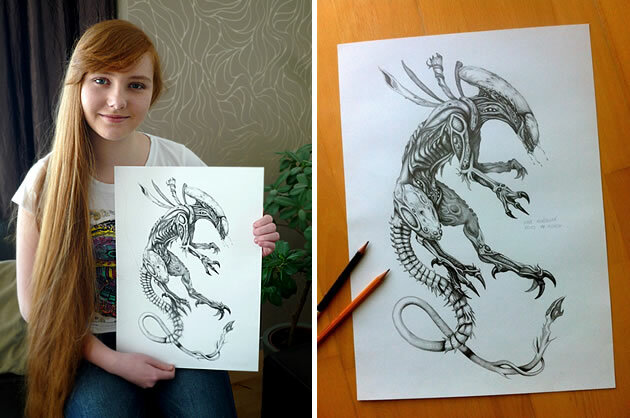 A pencil or black pen is used to redraw the missing portions creating a finished artwork. This may be a surrealist, imaginative exercise, where unusual or unexpected items are drawn in the missing spaces, or figures may be intentionally distorted or compressed. Alternatively, the final result may be entirely realistic. 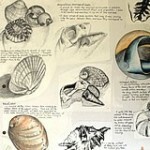 Observational drawings are always an excellent activity for Art students. This task can be described as a ‘drawing test’ to be assessed by the Art teacher upon return, encouraging the exercise to be treated with importance. 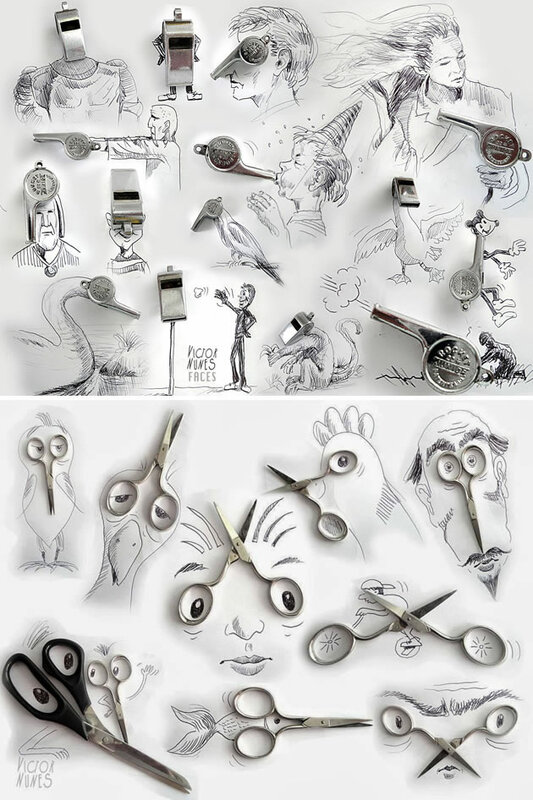 In this substitute lesson, students are shown images of Victor Nunes’ interactive drawings and then asked to select an interesting everyday object from their pencil case or within the Art room. Using a pen or pencil, students integrate this object within different drawings and take photographic records using their smartphones or a class camera. Some of these lesson ideas are Student Art Guide originals; many others are shared by experienced art teachers from around the world (contact us here if you would like to suggest an addition for this page)!